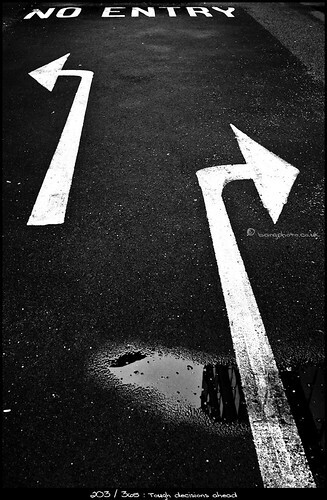 Tough decisions ahead, originally uploaded by bang*. Kinda reminded me of a certain friends 365 shot from a while ago. It’s funny how much we’re affected in what we shoot by our sub-conscious. Left or right, you choose, but one thing is for certain, you can’t carry on this way. As I say my sub-conscious is trying to remind me of a decision I promised I’d make this year. Those who have been with the blog for a while may know that this year I promised a year of refinement and focus. To really figure out where I’m headed in this life as a photographer, to shoot the things I really yearn to shoot and not rely on some of the jobs I’ve come to rely on in the past. Sure these jobs pay the bills and provide some giggles, however they also distract me from committing 100% to my dreams by giving me a safety net upon which I always know I can fall. They make me lazy in going with my ideas and as such I’ve realised have had me just floating through the last few years. This realisation came to me around about this time last year and so I decided to do something about it. Time to man up and take charge of this whole thing, this project was just one part of the process. I’d say personally this year has been my most creative, my hardest but also my most enjoyable. I’m starting to feel in charge of my own destiny again, a while back I wrote that although I wasn’t on the path to my goals yet I felt sure I knew where that path was. Well now I’m darn sure I’ve just caught a glimpse of it and I’m close to setting foot in a new direction. 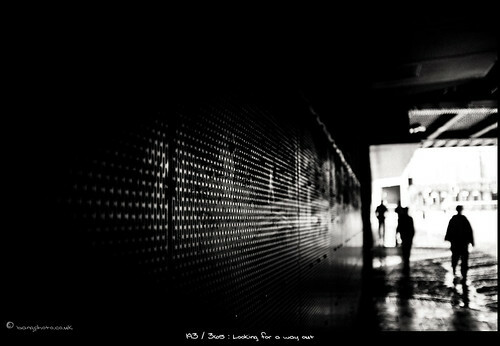 Looking for a way out., originally uploaded by bang*. Trapped in the belly of the city, people scurry around trying to feel busy, trying to win the race which in the end is only with themselves. Pretty dark couple of photographs from me it would seem for the last two days. Not sure what that’s all about, maybe it’s time to break out and photograph some rainbows and puppy dogs to lighten the mood. Although it’s Wednesday tomorrow so that should mean a new rider portrait if everything works out.